The Ultimate In Party Photo Services! Having a party? How about a wedding? How about a family reunion? Yep, this innovative service is perfect for ANY big event! How many times have you had your picture taken by someone else at an event and then proceeded to beg that person to email or heaven forbid "snail mail" you a copy of it? I have so few pictures of me or even of my family that I BEG everyone when they snap a picture of us....and I mean BEG!!! !¬† But do you think I ever see those pictures...nope! But Canditto has taken care of that! 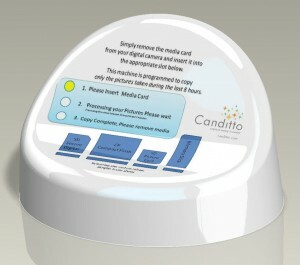 Canditto is a patent pending kiosk that will collect all the photos taken by your guests at your event. Your guest will simply insert their camera card into the kiosk and their images will be stored within the kiosk without doing any harm to your guests images on their card. It only copies photos taken in the last 8 hours - which means older images will not be copied to the kiosk! This is great for keeping your guests prior images private. Canditto is a rental only service. The kiosk is shipped directly to a person of your choosing who will manage the kiosk! Simply place the kiosk on a table where everyone can view it, plug it in and it is ready to roll! Images can be delivered on thumbdrives immediately after the event! This is a great giveaway for your guests too! Canditto is a weekly rental so it can also be used for you rehearsal dinner or any other family event that takes place during the week of your event! Everything you need comes included even the shipping! To get your Canditto for your next event by visiting rent a Canditto! Canditto has also offered our Cool Photo Idea readers a special for all ORDERS placed through June 30, 2009! Give them referral code 751429582 when placing your order and you will receive $50.00 off your order!